I'm sorry. It was too funny and I couldn't help myself. Lately I've just been finding myself embracing the crop. In the past I would have declared that the pants cut me off and make me appear shorter, and that in no way could a crop top ever pass as okay even in my most relaxed dress code work environment. But here I am, and it has most certainly been hot this month. These cropped culottes have dethroned pencil skirts as my summer work go-to. I so love these pants and this is such a cute Summer look. Very nice black and white striped outfit! Oh, how I love your look! Fabulous cropped pants and top! You look amazing! I 100% support that post title. And those pants, which I think look super stylish and comfortable (and that's a pretty good combo). LOVE the title of this post- now that song is going to be stuck in my head all day, lol. And this crop + culotte combo is really chic, lady! Ok I NEEEEEEd those mules!! Your crop top is so cute! It is totally my kind of cropped top because its cropped but doesn't necessary show any midriff! Plus, the scalloping is so cute! Those pants are so fun, but I REALLY love that top! Such a beautiful scallop! My favorite pant silhouette! I love cuffed hem, too! These are perfect! The striped crops are adorable on you. And that tank is too cute. Love love this look! You are working that crop top! I love the culottes too! Hope you are having a great week! This extreme mugginess has made getting dressed impossible! I love this look and how breezy yet polished it is for the office. Embrace the crop! I had this same ordeal last week when wearing culottes... i love how these look on you and i cannot tell the top is cropped. It's like a "decent" crop ? This blog post title is everything! What a lovely outfit. I love cropped shirts for the summer. The bracelet is fabulous! Chic and simple. For some reason there was no comment box for me to comment in, so I tried the reply box and it let me!! I used to adore crop tops---and now that the high waisted pants are coming back, I'm going to be all over them again!! You're definitely cropping it like it's hot hahaha! Love it! The black dress combines with these accessories so perfectly! Really love this outfit! Beautiful outfit! i love your blog!! Love this outfit! 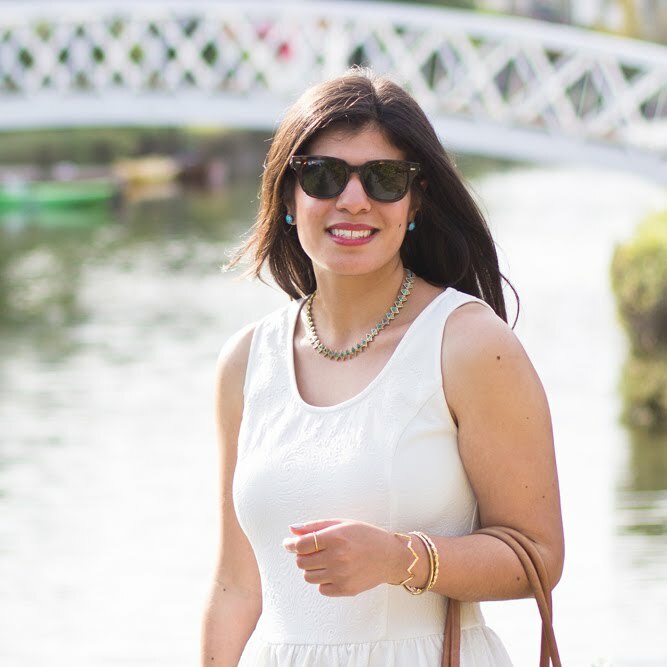 Such a perfect summer look! Well this look is one of my absolute favorites I think! And I would have thought the same things about both crop tops and cropped wide-leg pants, but you are making me want to reconsider too. This look totally works, and I think it's also really flattering! 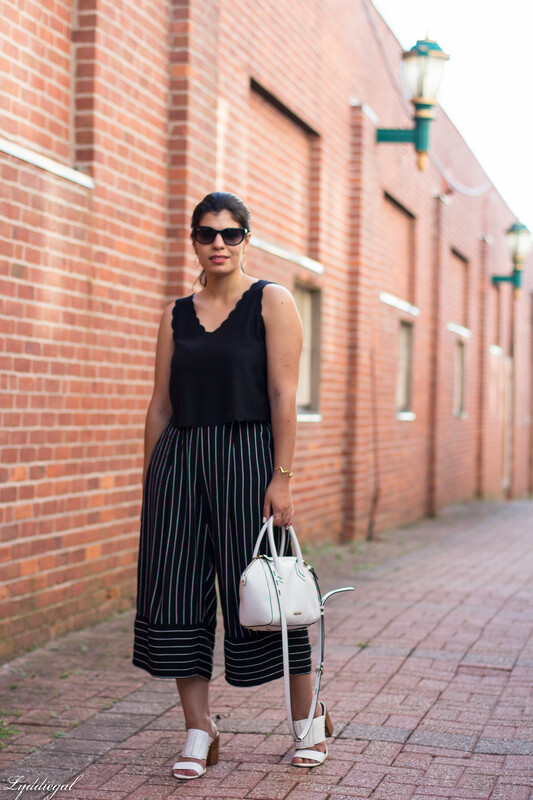 Crop tops and wide legged pants have to my go tos in the hot summers! 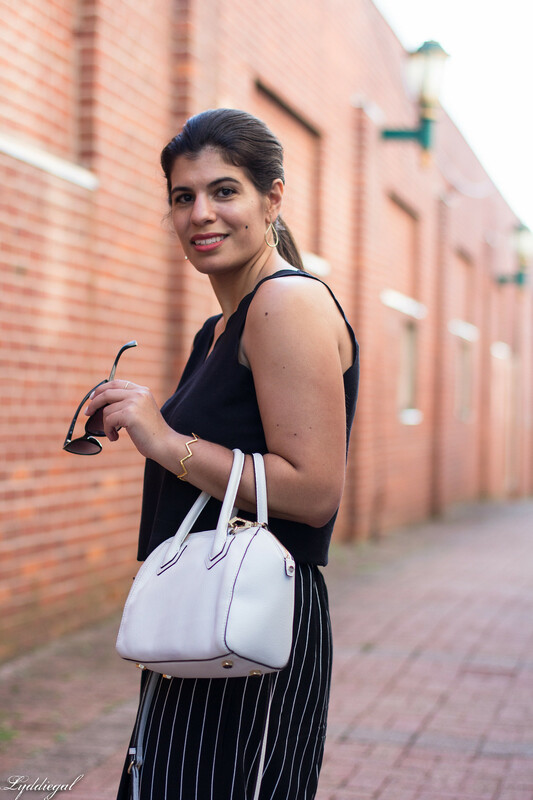 I love how relaxed and chic your outfit looks! The scallop cut out detail looks so nice!